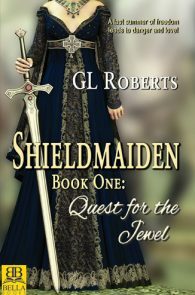 Jewel of Fire is the second book in GL Roberts’s beloved Shieldmaiden series. "My stories come from many sources. A glance. A song. A silent walk in the woods. Even a painting. 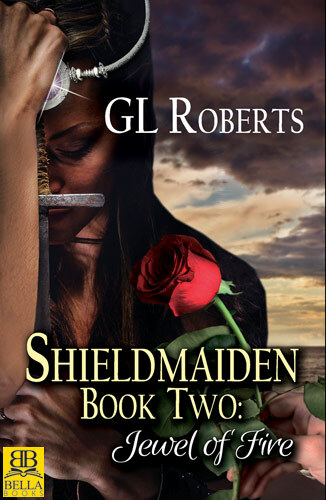 The Shieldmaiden series stepped out of a muted painting of the highlands of Scotland. A landscape of jutting rocks, rolling hills and endless vistas. I saw my heroine Bryn standing on one of the rocks looking out over a roiling sea. A story that started as a girl in love with a princess became a young woman in love with a country and its many clanns. Bringing her princess along for the adventure of a lifetime." The battle to keep the clanns safe was fought over hundreds of years. Each generation bore before them the standard of Athebryn of the Brae. Embroidered on the standard in silver thread is the Tree of Life, symbol of the High Clann Brae. Flying above the tree is a silver dragon and a dragon rider. Lady Athebryn rides with her sword drawn high above her head and the light from the jewel on her brow, a beacon to all her people. The battle began long ago, when dragons were innocent and man still amazed by the magic of the heavens. The Druids, children of the earth, with their compassion for all living things admired the dragons. They taught their wisdom to the fledgling nobles, and dragons became the property of the royal born. The elves, eldest of all races, chose not to deal with the dragons and thus separated themselves from the world of man. The Druids in their wisdom reserved the dragon lore for a time when it was most needed. Man coveted the dragon. It is that greed that forced the dragon’s hand. King Heardred stood on the banks of the fjord and shouted to the gods. “I will have my revenge!” In his heart he believed his beloved son Helstun was dead. Helstun would not return to Götaland, leaving the realm to fall to Heardred’s stepsons Hygid and Heoroth. The thought of either of those two sitting on his throne brought bitter bile to Heardred’s throat. Helstun’s delayed return was an ill omen for the King. The fact that Marget, his current wife and his brother’s widow, had given birth to four children before she became his wife, did not rest easy with the seers. They blamed her for not providing more than one son to the King. No one thought to blame the King. Heardred did not wish to wait for the other boats to return from their raid. Yet, being impulsive would not bode well with his people. He could not afford to lose the faith of his subjects, so he waited. He needed the fealty of his people to feed his armies. He needed the seer’s good graces to appease the growing number of houses that were laying claim to his throne. Heardred had the extra boats filled with supplies and kept his army at the ready. He was prepared to man the boats and launch at a moment’s notice. He would not waste one minute once he received news, good or ill on Helstun’s fate. Even if his son returned to him, Heardred did not intend to wait for winter to take the northern islands from the painted Picts or the docile Druids. Skerrabrae was another half day’s ride from the Standing Stones, and the company was already exhausted. The morning had started with the loss of the High Dragon and the birth of a revolution. Though now, if you asked, all would say it was more a dream than a reality. The evidence was there: the crown that sat on Bryn’s forehead and the jewel that seemed fused to her skin; the additional dragons and dragon riders that now rode with the company; and the knowledge that the enemy was moving toward them. All those things were tangible, touchable, accepted. Yet, they were just beginning to understand that their friend Bryn had changed. Bryn suspected from the moment Meylarn—the High Dragon of only two months—had replaced her dead father Meldred that Meylarn’s light would shine only briefly. It was in the hearts of all the dragons she met since leaving the Realm that Touches Two Seas. Their hearts believed a change was in the wind. They believed she would be the one to initiate that change. Bryn convinced the company of the need to slay the men who took Pict as slaves and looted and destroyed the outlying Pict and Druid villages. She believed that those men would kill those in her company had she not acted. Her first priority was the welfare of the Princess Thalynder. Killing the Jarl and his men would surely start a war. She understood she was generating a turning of the tide and initiating a revolution. 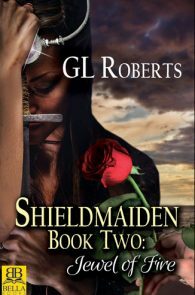 If the clanns would gather and fight the raiders, Bryn would know her challenge had been met. No matter the outcome. Uniting the clanns under one banner was of utmost importance. One leader, one cause. Life was the best cause of all. Bryn looked behind her to the others of her company and wondered if they truly understood what happened back at the Standing Stones. They were nearing Skerrabrae, and the farther away from the Circle they moved, the less likely the events that took place that morning seemed possible. She could see some of the company still looking up at the new dragons in their group and shaking their heads. When they looked at her, it was with unseeing eyes. “As if in a dream,” she mused. Meydra flew slowly above the company. She listened to Bryn’s heart as Bryn debated with herself. Her companion, Druid and Dragon Daughter, doubted her new position. It is a dream for some, Meydra told Bryn. It will be a nightmare for others. Meydra could feel the anxiety building in Bryn’s heart. At the Stones, Bryn accepted the crown and embraced all that the Stones whispered to her. She accepted her ancestry and the truth that she was possibly the last of a long line of Dragon Daughters. It was easy to do so with the Stones telling you their story and weaving a magic spell over the company. It was harder in the dimming light of evening with no shelter and a cold wind blowing. There was still much for Bryn to learn and accept. Her resolve was strong. Meydra embraced Bryn’s heart with her own. Bryn released a heavy sigh. Bryn dismounted from her horse, the ever steady Pymmar, and released his reins. “Go now and sup, my loyal friend.” Pymmar rubbed his nose against Bryn’s shoulder. He bent his head to nibble the grass. Bryn walked to a small group of stones and stared down at the ground around them. Arryn, now a dragon rider himself, still had doubts about the events of the day. The death of Meylarn and the subsequent joining of Meydra and Bryn confused him. He had not spoken with Bryn since leaving the Stones. All the years watching Bryn grow to become a woman, Arryn thought he understood her. Shieldmaiden to a princess. Druid child in a world of changes. She was given a choice at the Stones. He was as uncertain about the choice as she appeared to be. Bryn chose this path, knowing she would place herself where others might not wish to follow. The path would be difficult and treacherous. Arryn dismounted and called to his dragon. In a heartbeat’s time, the dragon swooped down to stand upon the ground before Arryn. The young dragon nodded at Arryn and lifted silently up and flew toward the east to sit and keep watch over the darkened sea. Arryn watched as his dragon disappeared into the fading light. He walked over to where Bryn still stood looking at the circle of stones. “You have been very silent.” Arryn bent down to stir at the ashes in the inner circle. A fire had been there recently. But for the moment, Arryn’s attention was on Bryn and not the ash. He stood up and gazed at Bryn. The crown sitting on her forehead with its center jewel fused to her skin glowed softly in the twilight. He reached up to touch the jewel, but Bryn gripped his wrist. Arryn studied the ash and beckoned Prince Malcolm to join them. Malcolm approached but kept his distance until acknowledged. A frown turned the corners of Bryn’s mouth. “We will have company at Skerrabrae,” Arryn said over his shoulder to Malcolm. “Join us, Malcolm. As a matter of fact, I want you all to draw closer for a moment.” She motioned to the others who had been standing around. They were like perplexed children, waiting to be told what to do. Bryn studied each of the company: the elves, Neulta and Leus, with their stony faces; Kenna, Princess of the Bridei clann; Malcolm, Prince of men belonging to the southern realm of Alban; Arryn of the Epidii, friend and ally. And her beloved, Thalynder, Princess of The Realm That Touches Two Seas. All wore faces lined with concern and full of question. “You are uneasy. Nothing has changed.” She clutched the sides of her tunic as she spoke. Bryn and Thalynder provided a meal of rabbit and marsh grass. The company sat and rested as the sun settled deep on the horizon. The sky would darken only slightly this time of the year. They were so far north that the sun would dip just below the horizon and there travel around to the east to rise again. Bryn let Kenna and Leus clean up after the meal, all the while watching the interaction between the two. She could see that Kenna was fascinated by the tall regal elf, and much to her surprise, noted that Leus appeared to be just as fascinated by the little Druid princess. Bryn wondered if Kenna even understood that it could have been her that was to lead the clanns. Kenna’s mother was an elf-sister, aunt to Bryn and sister to Bryn’s mother, and had every right to think her own kin would someday wear the crown. Thus far, the idea did not seem to cross Kenna’s mind. If it had, she was keeping very quiet about it. As the company rejoined each other at the fire, Bryn stood up. “I have need to speak with Meydra, after which I would like to sit and talk with you. Please excuse me for a moment.” She started for the area where the dragons had gathered in the dusk. “And what is that?” Malcolm asked. Arryn smiled. Kenna could have just as easily been tasked with this burden. He understood from all he saw in Anethar’s book and on the Gathering Stone at the circle that Kenna was also of the line of Athyl, daughter of an elf-sister, cousin to Bryn. They carried the same blood with perhaps the exception of Kenna’s father. That may be the difference, he mused. Bryn walked out to the dragons and greeted all with her heart. She stood in front of Meydra and held her arms open. Meydra bowed her head and they touched foreheads. The jewel in Bryn’s crown and the one on Meydra’s forehead glowed with a soft pink light. The two stood silent for several seconds. Bryn released her hold and stepped back a pace. She chose to speak aloud and in the ancient tongue of her clann. The words flowed effortlessly. “You were chosen to be the High Dragon after Menchor?” Bryn asked. “It has, Dragon Rider.” Bryn sat down next to Thalynder. “Wait until you ride one for the first time,” Kenna chimed in. The company laughed, and the charged air around them dissipated. Thalynder reached for Bryn’s hand. “What do you expect to find at Skerrabrae?” Arryn asked. “Are you now that queen?” Malcolm asked. “Does the jewel burn?” Kenna asked. “Can you hear all the dragons?” Arryn asked. The company laughed. Bryn was making it easy for them to become less intimidated by her and the idea that she was now a Dragon Daughter. And though none called her such, she felt it was on their minds. “Why do you take the trouble to ask us to speak with our dragons if you can save the step and speak directly with them?” Leus asked. “Why are there not more dragon tears among the riders?” Kenna asked. Thalynder turned her head to look at Bryn. Bryn could read the same question in her eyes. “Can a dragon be forced to shed a tear?” Malcolm asked. Bryn crossed her arms over her chest. “I would. Nevertheless, the dragons will not be a weapon in my army. They took an oath long before man stood upright and walked upon the earth to do no harm to humankind. To ask them to be our armor or our weapon would be to ask them to break an oath older than time.” Bryn heard the voices of the dragons echoing her words. She hesitated when she heard a dissenting voice among the dragons. She listened for a moment at the other dragons debating with their kin. But with all the voices speaking at once, she could not tell whose voice it was that caused her concern. Bryn listened as the men debated. She understood why Malcolm felt this way. She also understood from where Arryn spoke and agreed that using dragons as weapons was not the clann way. It never was. Dragons had always been companions. Yet again, she could see the logic behind Malcolm’s thinking. It was something she would discuss at length with Meydra. In her heart, she did not want to ask this of the dragons. In her head, she realized that with the dragons, the tide could be turned and her homeland could be bathed in a peace that may well linger for generations. The path had many turns and twists. For the moment, the only option for her was to get the company to Skerrabrae. There was much work to be done to unite the clanns under one banner. A murmuring rose from the men to discuss the issue further. She turned her attention to the rest of the company. Bryn took Thalynder’s hand, and they walked out toward the dragons who sat with their backs to the company, their eyes and ears ever mindful of the movements in the night. Though the midnight sun was just below the horizon and the sky glowed with a soft lavender, the night was as still as if it were the blackest of winter nights. Thalynder held tightly to Bryn’s hand as they walked out to the dragons. The others followed, as it was custom to bid your dragon goodnight, though the rest of the company hung back from the two women. “Will we sleep together, my Bryn?” Thalynder asked quietly. “I can, and I will. What is troubling you?” Bryn stopped before reaching Meydra and An Yun. I can love, Meydra said to Bryn’s heart. I have loved you all your life. As I have loved you, Meydra. We want to ease this passing for Lynder. Worry not, Dragon Daughter, An Yun said. The princess will soon feel the difference, and she will rejoice. “That is my first order of business.” Bryn turned to the dragons behind her. Each dragon bowed before her. She pulled her cloak around her shoulders and over her forehead and the company did the same. All now were cloaked against the cool sea air. “Reveal not my name,” she told the company. “I am Bryn of the Brae for now. Athebryn must wait to be named by the elders.” She started down the hill toward an uncertain future. From the center of the small village, a lone figure watched the dragons descend and line the hills. A smile creased the woman’s lips. Legend was about to cross the pasture and enter the ancestral village.